Psalm 2:7-9 - "...The LORD has said to Me, 'You are My Son, today I have begotten You. Ask of Me, and I will give You the nations for Your inheritance, and the ends of the earth for Your possession. You shall break them with a rod of iron; You shall dash them to pieces like a potter's vessel.'" What does it mean to rule with "a rod of iron"? Isaiah 9:6-7 - For unto us a Child is born, unto us a Son is given; and the government will be upon His shoulder. And His name will be called Wonderful, Counselor, Mighty God, Everlasting Father, Prince of Peace. Of the increase of His government and peace there will be no end, upon the throne of David and over His kingdom, to order it and establish it with judgment and justice from that time forward, even forever. The zeal of the Lord of hosts will perform this. Zechariah 14:16-19 - And it shall come to pass that everyone who is left of all the nations which came against Jerusalem shall go up from year to year to worship the King, the LORD of hosts, and to keep the Feast of Tabernacles. And it shall be that whichever of the families of the earth do not come up to Jerusalem to worship the King, the LORD of hosts, on them there will be no rain. If the family of Egypt will not come up and enter in, they shall have no rain; they shall receive the plague with which the LORD strikes the nations who do not come up to keep the Feast of Tabernacles. This shall be the punishment of Egypt and the punishment of all the nations that do not come up to keep the Feast of Tabernacles. As already discussed, the Tribulation martyrs will have a special place as servants in God's temple (Revelation 20:6), and the believers who survive the Tribulation will become the local governors and mayors of the Kingdom (Matthew 25:23, Luke 19:16-19). Revelation 20:7-10 - Now when the thousand years have expired, Satan will be released from his prison and will go out to deceive the nations which are in the four corners of the earth, Gog and Magog, to gather them together to battle, whose number is as the sand of the sea. They went up on the breadth of the earth and surrounded the camp of the saints and the beloved city. And fire came down from God out of heaven and devoured them. The devil, who deceived them, was cast into the lake of fire and brimstone where the beast and the false prophet are. And they will be tormented day and night forever and ever. After the thousand years comes to an end, God will give man over to their rebellion hearts and release Satan from the bottomless pit. It won't take long for Satan to amass an army against Christ too large to count. God's patience with man's rebellious heart will end here. This army of rebels will promptly be consumed by fire. God will prove that man can never meet His standards. Only a repentant heart that accepts the covering of the blood of Jesus will make a man righteous in the sight of God. For more on the Millennium, click here. Revelation 20:10-15 - The devil, who deceived them, was cast into the lake of fire and brimstone where the beast and the false prophet are. And they will be tormented day and night forever and ever. Then I saw a great white throne and Him who sat on it, from whose face the earth and the heaven fled away. And there was found no place for them. And I saw the dead, small and great, standing before God, and books were opened. And another book was opened, which is the Book of Life. And the dead were judged according to their works, by the things which were written in the books. The sea gave up the dead who were in it, and Death and Hades delivered up the dead who were in them. And they were judged, each one according to his works. Then Death and Hades were cast into the lake of fire. This is the second death. And anyone not found written in the Book of Life was cast into the lake of fire. 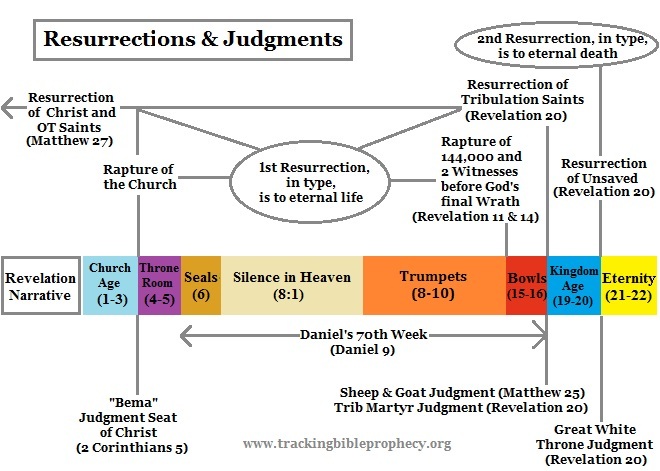 Before the "Great White Throne Judgment," those not saved are resurrected from the dead. After these unbelievers stand before God, they are "cast into the lake of fire," where they will die a second death. This second death is not annihilation, as we see that the antichrist and his false prophet are still in the lake of fire being tormented when Satan joins them a thousand years later. The second death is permanent separation from God and eternal suffering. Revelation 21:1-5 - Now I saw a new heaven and a new earth, for the first heaven and the first earth had passed away. Also there was no more sea. Then I, John, saw the holy city, New Jerusalem, coming down out of heaven from God, prepared as a bride adorned for her husband. And I heard a loud voice from heaven saying, "Behold, the tabernacle of God is with men, and He will dwell with them, and they shall be His people. God Himself will be with them and be their God. And God will wipe away every tear from their eyes; there shall be no more death, nor sorrow, nor crying. There shall be no more pain, for the former things have passed away." Then He who sat on the throne said, "Behold, I make all things new." For more on eternity, click here. This study has shown that a Pre-Tribulation rapture is the only view that makes sense, in light of the natural flow of prophetic events in Scripture. One of the biggest road blocks to coming to that conclusion, is to fail to differentiate between the rapture event and the 2nd Coming event. This was the same mistake made by the Jewish leaders back before the 1st Coming of Christ, in that they failed to separate the scriptures pointing to the 1st and 2nd Comings of the Messiah. Because of this mistake, the Jewish leaders, and even the disciples thought that the Messiah was going to come and conquer the Romans, and set up His Kingdom when He arrived. They overlooked that Scripture not only pointed to the Messiah coming as King, but also that He would suffer as a servant. As a result, most of the Jewish leaders rejected Jesus as Messiah. It is important to note that some Jewish leaders did see the two different aspects of the Messiah. These leaders decided there would be two messianic figures, but they still rejected Jesus based on errors introduced into the Jewish calendar, in addition to their corrupt hearts. Keep in mind that they had the exact time frame for the coming of the Messiah from Daniel's prophecies. Luke 4:16-19 - So He came to Nazareth, where He had been brought up. And as His custom was, He went into the synagogue on the Sabbath day, and stood up to read. And He was handed the book of the prophet Isaiah. And when He had opened the book, He found the place where it was written: "The Spirit of the LORD is upon Me, because He has anointed Me to preach the gospel to the poor; He has sent Me to heal the brokenhearted, to proclaim liberty to the captives and recovery of sight to the blind, to set at liberty those who are oppressed; to proclaim the acceptable year of the LORD." When you go back to the passage Jesus quoted from in Isaiah 61, you find that He deliberately stopped before reading this part: "And the day of vengeance of our God." If Christ had read this last part in Luke 4, then He would have proclaimed the "day of vengeance" at His 1st Coming. Jesus deliberately left the last part out when He spoke because the "day of vengeance" will be at His 2nd Coming. Malachi 3:1-3 - "Behold, I send My messenger, and he will prepare the way before Me. And the Lord, whom you seek, will suddenly come to His temple, even the Messenger of the covenant, in whom you delight (1st Coming - The messenger was John the Baptist). Behold, He is coming," Says the LORD of hosts. "But who can endure the day of His coming? And who can stand when He appears? For He is like a refiner's fire and like launderers' soap. He will sit as a refiner and a purifier of silver; He will purify the sons of Levi, and purge them as gold and silver, that they may offer to the LORD an offering in righteousness (2nd Coming). In conclusion, I hope that this study has brought you assurance of our "blessed hope" (Titus 2:13) in the Pre-Tribulation rapture. I also hope that you better understand how the natural flow of prophetic Scripture is in harmony with the Pre-Tribulation rapture view. The more I study this topic, the more confident I become that the rapture will happen before the Tribulation, and the more blessed and excited I become, anticipating the soon return of our Lord. I pray the same for you. Maranatha!